It’s Friday, so we thought we’d bring you something casual. Introducing the new Hadleigh’s, twice as big as the old Hadleigh’s and now stocked with a bar and a lounge, opening tonight and available after that by appointment. You may already be familiar with Hadleigh’s. For the past couple of years, it’s been a hush-hush place for guys in the know to get their closet freshened up courtesy of a few well-curated racks (and yes, some cashmere slippers). But the new Hadleigh’s is a whole new ball game. It’s still in the same space, but it’s gone from a 500-square-foot loft to a 1,025-square-foot loft. There’s a bar/kitchenette area, a lounge with black leather chairs, display cases all around, dark wood floors and exposed wooden beams. It feels like Troy Aikman’s apartment circa 1992, only chick magnet-ier. So, you’ll come in and say hello to Ed, a Ralph Lauren vet. Someone will bring you a cocktail and whatever food you’d like—a PB&J sandwich, a steak, whatever. Then you’ll share with them your every fashion desire. 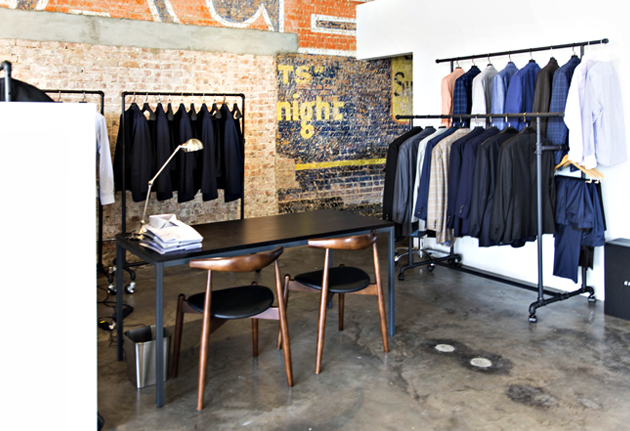 They’ll guide you through their stock of handmade Italian shirts, custom French watches, suit jackets and pants. 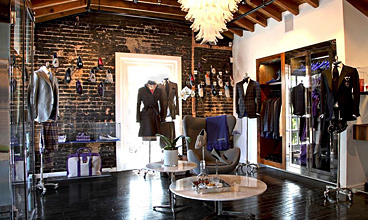 And if you end up getting a wardrobe overhaul, you’ll also get an iPad to display your virtual closet.